Sussex opening batsman Chris Nash described day one of Sussex’s match with Essex as ‘quite an emotional day’. Sussex paid tribute to their former fast bowler Matthew Hobden before their first County Championship match at Hove this season. The 22-year-old was found dead at a private property in January after celebrating New Year with friends. A tree was planted in memory of the fast bowler at the Hove ground and team-mates wore shirts with the number 19 and Hobden on the back in his honour. Nash then hit 119 as Sussex finished on 355-8. Nash said: “It was quite an emotional day. We had the ceremony for Hobbsy (Matt Hobden) before play and spoke to his family in the dressing room and he was never far from our thoughts all day. We want to do well for him in this game and throughout the season. “It’s always nice to get runs in the first game. I got off to a flier with a few boundaries and built from there. Essex bowled well after lunch to be fair but I’m pleased the hard work I did in the winter with Gary Kirsten has already paid off. “I worked on making myself taller in the crease and moving around less and hopefully this is the start of a big summer for me. As a team we’re disappointed because at 188 for 0 we were in a really strong position. But there is something in the wicket for the bowlers. Essex coach Chris Silverwood said: “Credit to Sussex, Nash and Ed Joyce batted really well before lunch so I was pleased with the way we fought back in the afternoon. 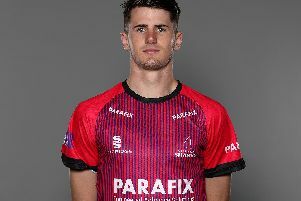 “Ryan ten Doeschate rotated the bowling really well and picked up those two wickets as well – perhaps he should bowl himself a bit more!